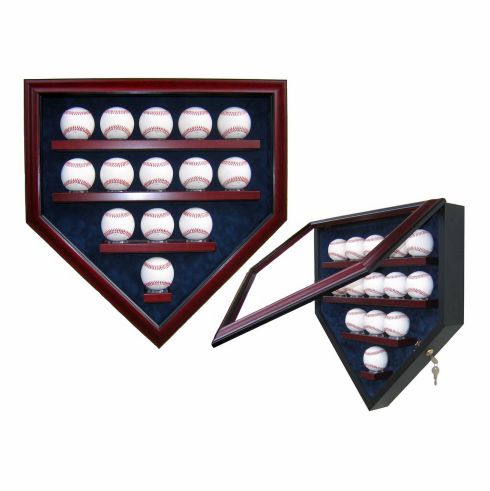 Premier Home Plate Shaped 14 Baseball Display Case proudly handcrafted in the USA. This 14 Baseball Display Case measures appx. 21.5" wide x 22.5" tall and features an easy opening door with a lock to keep your collection safe. Shadowbox and door are solid wood. The baseballs sit on top of individual ball holders. The Display Case has "UV" filtered Conservation Glass in the door of the table which blocks out 99% of the harmful "UV" rays. Baseballs pictured are not included. Custom options are available...call for details.